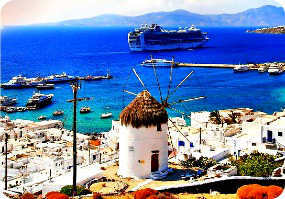 Book now the best shore excursions in Mykonos. High quality and safety at the lowest prices. If your are looking for Shore Excursion Mykonos, book now the best guided tours at lowest price with Ancora Tours. Since 2003 we offer you official guides in english, transportation and travel insurance, all included. The highest quality at the lowest rates. Our shore excursion will show you that’s there’s more to Mykonos than DJs and discotheques. While the island is well known for its nightlife, there’s much more on offer here. We’ll enjoy the best of Mykonos’ natural wonders; white beaches, clear waters and plenty of sunshine. What’s eating: If you don’t feel like the typical Greek Salad, opt for Tyropithakia; a type of salad pie filled with Feta cheese. Dress Code: Please note the dress code recommended to enter any church. No shorts, bare shoulders or miniskirts. This applies to both men and women. Comfortable walking shoes and sunscreen are recommended. Our shore excursion leaves port by bus to reach the centre of Mykonos. The first part of the Mykonos shore excursion is a walking tour of the island. To see the whitewashed buildings in photos and on TV is one thing, but to explore the crowded streets on foot is a different thing entirely. We’ll admire the many beautiful small churches, chapels and museums we pass along the way. If we’re lucky we might just see a pelican too. Mascots of the city, these birds sometimes venture out when there are fewer crowds. To conclude the shore excursion we’ll take in the natural wonders of Mykonos. We’ll spend a little time on the two of the island’s most famous beaches, Kalfatis and Elia. Sunbathe for a while and enjoy the views out towards the crystal-clear blue sea. A relaxing end to a day well spent in one of the most popular Greek islands. The shore excursion service is organised by Ancora Tours, regardless of the cruise line or company mentioned. References to the cruise line companies are intended for information purposes only and to identify the services offered by Ancora Tours. The cruise companies do not sponsor, collaborate or support services organized directly by Ancora Tours.